Way back in the early 80's I was doing movie parodies for Crazy Magazine. This is a character sketch I did prior to the parody. I no longer have a copy of the parody but it was a real turning point in my drawing and story telling. 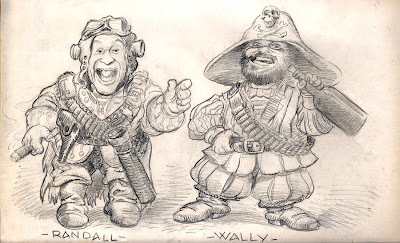 Time Bandits was cool. You do have a talent for caricature. Keep the good stuff coming. Time Bandits was Awesome. I need to dig my copy out and watch it again. Nice to see you back Bob. I love these drawings. Would've also love to have seen the issue of this magazine.